In today's post, I would like to talk about a customer's blog. Dani, who lives in Australia and makes ballet costumes for her daughter, got in touch with us a few weeks ago. 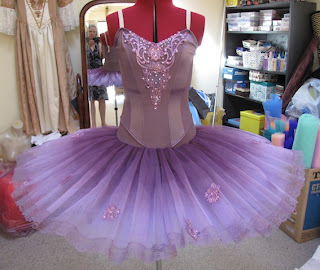 She sent us pictures of what she had made with the 2915 tutu pattern. I was more than impressed with the quality of her sewing and attention to details! She recently set up a blog where she discusses her latest creations and where everyone can see pictures of her beaaaaaaaautiful tutus. Seriously... All those lovely fabrics, colors, decorations... The hours of work... We can really tell that she has a true passion for both dance and sewing.